Mountains, beaches and a challenging hilly trail run through a vast, unspoiled wilderness that sits right across the bay from San Francisco await at this race, an out-and-back loop that starts at Rodeo Beach in the Marin Headlands of the Golden Gate National Recreation Area. Runners should expect a “mud bath” at the late winter/early spring running of this race along the trails of Washington’s Capitol State Forest, a 91,600-acre forest that lies just five miles from the urban streets of nearby Olympia. Billed as trail running “at its funnest and toughest,” this race unfolds through the single-track trails, woods and wilderness of Indiana’s Owen-Putnam State Forest, and includes more than 6,000 feet of elevation gain for its 50-mile event. The deep woods trails alongside the cool, green Clarion River in northwestern Pennsylvania are the setting for this race, which takes place every spring in this 6,668-acre state park, often called the “Black Forest” and located just over 30 miles north of the town of Punxsutawney, of “Groundhog Day” fame. Run among the challenging hills and beautifully scenic valleys of the River Valley Ranch summer camp retreat just outside Manchester, a small rural town that lies less than an hour’s drive from Baltimore and Washington, D.C.
You’ll join roughly a thousand or so fellow trail runners along the winding single-track trails inside Michigan’s Pinckney State Recreation Area at this race, which runs through the wilderness area known to locals as the “Protto” and to the rest of us as Potowatami Trail. 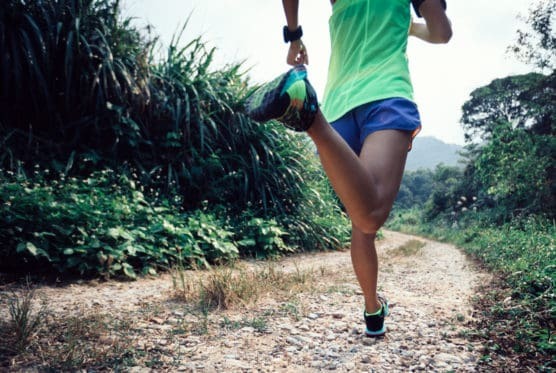 Named one of America’s most scenic trail races by Trail Runner magazine, the course takes runners along what is known as the Ice Age Trail in Wisconsin’s Kettle Moraine State Forest, whose topography was formed by the receding of the Wisconsin glacier some 13,000 years ago. A few hundred runners cross the finish line here each year, at a race which takes runners on a mix of roads and trails through redwood forests, with fog from the nearby Pacific Ocean helping keep conditions cool along the course. The name of this race captures perfectly the scenery runners can expect to encounter here in eastern Idaho, where the mountains on either side of the Montana-Idaho border meet among the trees of the Lolo and Clearwater National Forests. You’re going to be very sore the day after you finish this race between Jonas Ridge and Mortimer, N.C., as the elevation drops more than 2,000 feet from the start to the finish in the Pisgah National Forest, near the southern end of the Appalachian Mountains. You’ll need to be ready for high mountain running at this race, which unfolds above 9,000 feet above sea level and features some of the most spectacular natural beauty in the western U.S., through the Beaverhead Deerlodge National Forest in Montana’s southwestern corner. Just off the coast of this small city on Lake Superior along Michigan’s Upper Peninsula, runners get a chance to run the trails, hills, beaches and forests of the 13,500-acre Grand Island National Recreation Area, which is accessible only by ferry boat. Dramatic scenery and the chance to run through the hills and rain forests above the town of Volcano here on the big island of Hawaii are the draw at this race, which follows trails near the entrance to Hawaii Volcanoes National Park. Colorado’s Cache la Poudre River and the Poudre River Canyon serve as the setting for this race, which takes place at the time of the autumnal equinox. Starting at 5,900 feet above sea level, it’s all downhill from there as runners make their way through the Roosevelt National Forest. You’ll run in the shadow of coast redwood and Giant Sequoia trees that line the Avenue of the Giants highway at this fall race through Northern California’s Humboldt Redwoods State Park, many of which reach more than 200 feet in the air and are more than a thousand years old. Called the “highest race in West Virginia” by the race organizers, this race (which also features a 50K and 50-miler) takes runners on a tour of the winding trails up and down the mountains of the Monongahela National Forest in the state’s northeastern corner. I live in Fort Collins, Colorado. The Fall Equinox Half, while still beautiful, is run on State Highway 14 down the canyon. None of it is on trails.